Blunt chest trauma commonly occurs during road traffic accidents in up to 20% of cases although traumatic aortic regurgitation (AR) is said to be rare. Reports indicate that cardiac injury is observed in 15–20% of autopsy cases, whereas valve injury is observed in 5% . 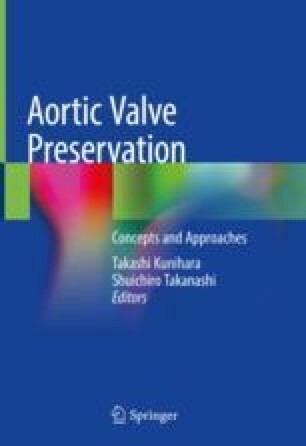 Valve injury may affect the aortic, mitral, or tricuspid valve. The most commonly observed lesions of the aortic valve (AV) in these cases are leaflet injury and disruption of the leaflets from the annulus, which most commonly affect the noncoronary cusp (NCC) [2–7]. The mechanism of AV injury involves the application of compressive force to the sternum from an anterior direction during early diastole; the aorta is compressed between the sternum and the vertebrae while the AV is closed, which leads to excessive pressure being exerted on the AV, thus causing injury . There is speculation that the NCC might be more commonly injured because the leaflets with coronary ostia are able to avoid this pressure by diverting blood flow into the coronary arteries .